Community colleges serve diverse segments of society through a flexible and open access. By their very nature, community colleges provide a good fit with online learning. Unfortunately, online course dropout rates are high. The costs of course dropout are borne by students, community colleges, and the society. There is, therefore, a vital need to better understand factors influencing community college online course dropout. A review of studies on conventional and online learning dropout models and a survey of 30 community colleges on online self-assessment practices conclude that there is no single indicator that can effectively predict online course dropout. On the other hand, there are several learner controllable indicators that, taken collectively, are potential predictors of online course dropout. Among them, psychological, technological, and social factors have emerged as common and widely-used predictive concepts. This article proposes a framework along these three dimensions to describe, organize, and explain learner-oriented factors influencing community college online course dropout. This proposed framework, when applied as part of a comprehensive retention strategy, has the potential for contributing to the reduction of the dropout rate in community college online learning programs. Liu, S., Gomez, J., Khan, B. & Yen, C.J. (2007). Toward a Learner-Oriented Community College Online Course Dropout Framework. International Journal on E-Learning, 6 (4), 519-542. Waynesville, NC USA: Association for the Advancement of Computing in Education (AACE). Retrieved April 20, 2019 from https://www.learntechlib.org/primary/p/21789/. Allen, I., & Seaman, J. (2005). Growing by degrees– Online education in the United States, 2005. The Sloan Consortium. Bean, J. (1980). Dropouts and turnover: The synthesis and test of a causal model of student attrition. Research in Higher Education, 12(2), 155-187. Bean, J. (1982). Student attrition, intentions, and confidence: Interaction effects in a path model. Research in Higher Education, 17(4), 291-320. Bean, J. (1983). The application of model of turnover in work organizations to the student attrition process. Review of Higher Education, 6(2), 129-148. Bean, J. (1985). Interaction effects based on class level in an exploratory model of college student dropout syndrome. American Educational Research Journal, 22(1), 35-64. Bean, J., & Metzner, B. (1985). A conceptual model of nontraditional undergraduate student attrition. Review of Educational Research, 55(4), 485-540. Boyles, L.W. (2000). Exploration of a retention model for community college students. Unpublished doctoral dissertation. The University of North Caroline at Greensboro. Braxton, J., & Lien, L. (2000). The viability of academic integration as a central construct in Tinto’s interactionalist theory of college student departure. In J. Braxton (Ed. ), Reworking the student departure puzzle (pp. 11-28). Nashville, TN: Vanderbilt University Press. Campbell, S.M. (1999). Understanding your needs: Overcoming the personal barriers to success in distance learning. In G.P. Connick (Ed. ), The distance learner’s guide. Upper Saddler River, NJ: Prentice Hall. Corbeil, J.R. (2003). Online technologies self-efficacy, self-directed learning readiness, and locus of control of learners in a graduate-level web-based distance education program. Unpublished doctoral dissertation, University of Houston. Garland, M.R. (1993). Student perceptions of the situational, institutional, dispositional, and epistemological barriers to persistence. Distance Education, 14(2), 181-198. Garrison, D.R., Anderson, T., & Archer, W. (2000). 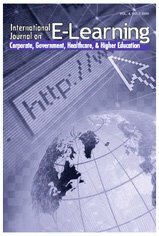 Critical inquiry in a text-based environment: Computer conferencing in higher education. The Internet and Higher Education, 2(2-3), 1-19. Harasim, L. (1990). Online education: An environment for collaboration and intellectual amplification. In L. Harasim (Ed. ), Online education: Perspectives on a new environment. New York: Praeger. Hart, J. (1999). Improving distance learning performance. In G.P. Connick (Ed. ), The distance learner’s guide. Upper Saddler River, NJ: Prentice Hall. Horton, W. (2000). Designing web-based training. New York: John Wiley& Sons. Jun, J. (2005). Understanding e-dropout. International Journal on E-Learning, 4(2), 229-240. Kember, D. (1989). A longitudinal process model of drop-out from distance education. Journal of Higher Education, 60(3), 278-301. Kember, D. (1995). Open learning courses for adults: A model of student progress. Englewood Cliffs, NJ: Education Technology Publications. Khan, B.H. (2005). Managing e-learning Strategies: Design, delivery, implementation and evaluation. Hershey, PA: Idea Group Publishing. Long, H.B. (1989). Self-directed learning: Emerging theory and practice. Norman, OK: Oklahoma Research Center for Continuing Professional and Higher Education of the University of Oklahoma. Long, H.B. (1992). Philosophical, psychological and practical justifications for the study of self-directed learning. In H.B. Long and Associates, Self-directed learning: Application and research. Norman, OK: Oklahoma Research Center for Continuing Professional and Higher Education. Lynch, R. (2003). The relationship between academic self-regulation and online distance education. Unpublished doctoral dissertation, University of Southern California, Los Angeles. Lynch, R. (2003). The relationship between academic self-regulation and online distance education. Doctoral Dissertation. University of Southern California. Miltiadou, M. (2000). Motivational constructs as predicators of success. Unpublished doctoral dissertation. Arizona State University, Phoenix. Moore, M., & Kearsley, G. (1996). Distance education: A systems view. Belmont, CA: Wadsworth. Napoli, A.R., & Wortman, P.M. (1998). Psychosocial factors related to retention and early departure of two-year community college students. Research in Higher Education, 39(4), 419-455. Osborn, V. (2001). Identifying at-risk students in videoconferencing and web-based distance education. The American Journal of Distance Education, 15(1), 41-54. Palloff, R.M., & Pratt, K. (1999). Building learning communities in cyberspace. San Francisco: Jossey-Bass Publications. Parker, A. (1995). Distance education attrition. International Journal of Educational Telecommunications, 1(4), 89-406. Pascarella, E.T., & Chapman, D.W. (1983). A multi-institutional, path analytic validation of Tinto's model of college withdrawal. American Educational Research Journal, 20(1), 87-102. Phillippe, K., & Patton, M. (2000). National profile of community colleges: Trends and statistics (3rd ed.). Washington, DC: Community College Press. Powell, R., Conway, D., & Ross, L. (1990). Effects of student predisposing characteristics on student success. Journal of Distance Education, 5(1), 5-19. Roblyer, M.D. (1999). Is choice important in distance learning? A study of student motives for taking internet-based courses at the high school and community college levels. Journal of Research on Computing Education, 32(1), 157-171. Snyder, T. (2001). Digest of education statistics. Washington, DC: U.S. Department of Education. Spitzer, D.R. (2001). Don’t forget the high-touch with the high tech in distance learning. Educational Technology, 41(2), 51-55. Summers, M. (2003). Attrition research at community colleges. Community College Review, 30(4), 64-84. Tinto, V. (1987). Leaving college: Rethinking the causes and cures of student attrition. Chicago, IL: The University of Chicago Press. Tinto, V. (1993). Leaving college: Rethinking the causes and cures of student attrition, (2nd ed.). Chicago: The University of Chicago Press. Tinto, V. (1997). Classrooms as communities: Exploring the educational character of student persistence. The Journal of Higher Education, 68(6), 599-623. Vaughn, G. (1999). The community college story. Washington, DC: Community College Press. Vrasidas, C., & Mclsaac, M.S. (1999). Factors influencing interaction in an online course. The American Journal of Distance Education, 73(3), 22-36. Wang, A., & Newlin, M. (2002). Characteristics of students who enroll and succeed in web-based psychology classes. Journal of Educational Psychology, 92(1), 137-143. Webb, M. (1989). A theoretical model of community college students degree persistence.